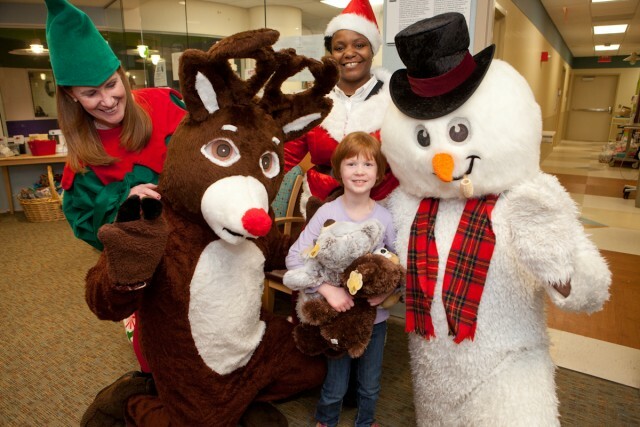 FORT LEE, N.J. – On Christmas Eve, CareOne employees will complete the last of five special Christmas holiday toy deliveries to the children of the Valerie Fund Children’s Centers for Cancer and Blood Disorders. CareOne CEO Daniel E. Straus said that more than 3,000 toys were collected and donated by the CareOne community. The toys were donated and collected by members of the CareOne community in the 60 CareOne facilities in New Jersey, Massachusetts, Pennsylvania and Virginia. They were delivered by Santa and his elves, along with CareOne helpers, to five Valerie Fund healthcare centers. The centers are New Jersey’s largest network of healthcare facilities for children with cancer and blood disorders. The Christmas Eve delivery to Newark Beth Israel Medical Center in Newark, New Jersey was preceded in recent days with deliveries and parties at four Valerie Fund centers: Morristown Medical Center, Morristown; Saint Barnabas Medical Center, Livingston; Children’s Hospital of Philadelphia, Voorhees; and Children’s Hospital at Monmouth Medical Center, Long Branch. Earlier this month, CareOne’s Straus announced that the CareOne community will conduct a significant 2014 fundraising campaign to benefit the Valerie Fund. Straus announced then that $10,000 was being donated to the group and pledged that the toys would be delivered to the centers’ children by Christmas. CareOne is also planning a major fundraising gala during Valentine’s Day week to support The Valerie Fund, as well as, a significant volunteer effort to support the Valerie Fund’s annual Camp Happy Times – an annual free one-week overnight camp experience for children aged 5-21 who have or have had cancer. Nearly 200 children attend each summer. Each Valerie Fund center is located at a top pediatric hospital within an hour’s drive of most of New Jersey’s population, providing state-of-the-art medical and emotional care in a happy, upbeat, child-centered atmosphere. Additional CareOne fundraising activities are still in the planning stage and will be announced at a later date, Straus said.